A concrete driveway is a welcome addition to nearly any new home. It adds that finishing touch on the exterior of a home and definitely adds value to the house as well. Although concrete driveways are almost hassle-free, they still need routine care and maintenance from time to time. We here at Niagara on the Lake Realty feel that this timely upkeep will help preserve the life and the look of your driveway allowing you years of enjoyment. Concrete may be the longest lasting material for a driveway. Although the initial price point is higher than other materials, concrete is very durable and will last for many, many years. Cleaning your driveway and applying sealer is the best way to keep your driveway looking like new and to extend its life. 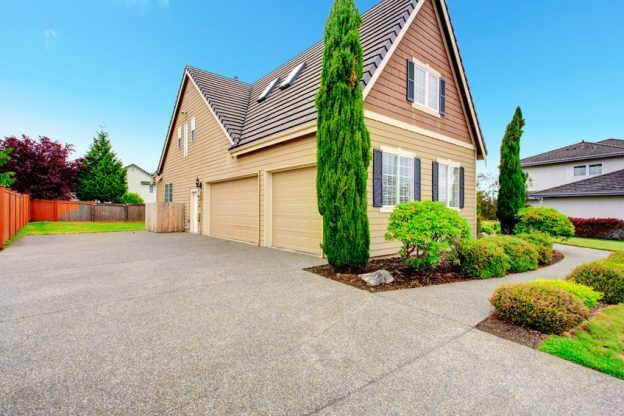 The amount of traffic your driveway sees and the type of elements it is exposed to will determine how often you seal your concrete driveway; more traffic and harsher weather means your driveway will require a sealant more often. It is recommended, however, that you apply a sealer at least once every two years or when the finish begins to show signs of wear. You can find concrete driveway sealant at your local hardware store. Remember to always follow the manufacturer’s instructions when applying the sealer. Winter can be particularly hard on a concrete driveway. It is recommended to never use de-icer on your driveway as the chemicals can react with your driveway; instead, use sand for traction. De-icer can also cause unwanted cracking by speeding up the freezing and thawing process, allowing moisture to seep into the pores of your concrete driveway. Also, take great care when plowing or using a snow blower on your driveway. You want to avoid scraping the concrete with any type of metal blade, which may chip your driveway. Some final recommendations to keep your driveway looking like new is to always remove stains, such as from gasoline or oil spills. Over time, these products can begin to erode your driveway. Finally, remember that your concrete driveway does have weight limits. Avoid parking moving vans or other heavy vehicles on the driveway, as it is not constructed to manage such weight and may crack. A concrete driveway is an ideal foundation that encourages basketball games, skateboarding, street hockey games or other activities that can be enjoyed by the neighbourhood kids. If kids or activities are not your thing, a concrete driveway also offers an aesthetically pleasing look and adds value to your home. By following these few steps, you should extend the life expectancy of your driveway and keep it looking like new. If you are looking for a new home, be sure to visit our listings page. This entry was posted in Blog, Uncategorized and tagged Concrete Driveway, driveway, tips on March 23, 2015 by wp_admin.